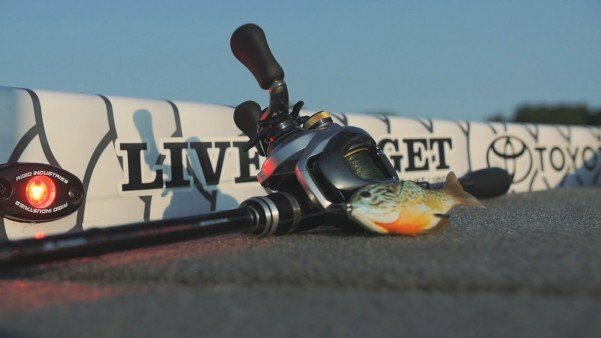 Over the last few years, LIVETARGET has raised the bar for fishing tackle. The company burst onto the fishing scene with incredibly lifelike crankbaits and hasn’t looked back since, steadily bringing new and exciting baits to the market. The Hollow Body Sunfish, winner of the ICAST Best of Show Soft Lure award and LIVETARGET’s latest offering, recently arrived and I took it for a test drive while on vacation. The Sunfish is built with an impressively molded body and color pattern (12 patterns to choose from) to perfectly mimic a sunfish, but where it truly sets itself apart is in its technique, which allows the floating bait to be worked through pads and weeds on the surface like a frog. Also, like a topwater frog bait, the sunfish utilizes a double hook that collapses against the body on a strike, allowing for a solid hook-up. I also discovered that, depending on how you twitch it, the bait has several different actions. For example, longer twitches create a wider walk on the retrieve, while quick twitches produce a very tight walk. You can also twitch it while it’s facing forward with no slack on the line, which causes it to hop out of the water like a dying bluegill. The bait’s design and considerable size allow you to cast it a country mile, enabling you to cover a lot of thick cover on a single cast. I found, though, that the Sunfish’s size meant that each cast produced a loud splash, which can spook fish sometimes. Also, while the hooks are sharp and perfect out of the box, I did find that they were so sharp that they dug into the bait now and then. Finally, while most of LIVETARGET’s baits are on the pricier side, the Sunfish takes the cake with a price tag of $12.99, which is likely to be out of many anglers’ budgets. The LIVETARGET Hollow Body Sunfish does bring something new and different to the topwater game, offering a different action and profile that can be just the spark needed to draw a strike, but the tried and true topwater frog would still be my first choice when fishing thick vegetation. If your budget allows, the Sunfish can be a great option for sparse cover or when fish are in the mood for something different.